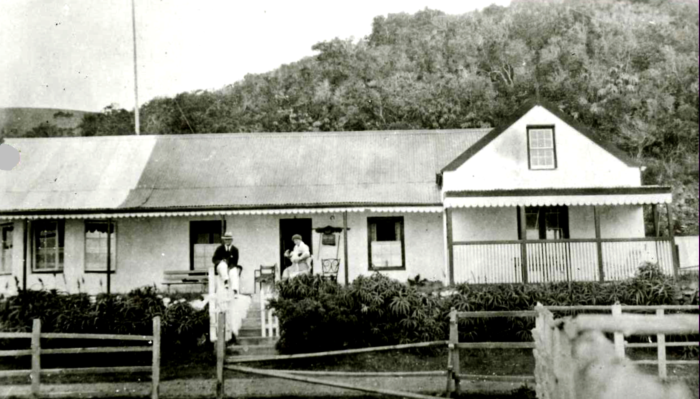 In 1896 Thomas Duthie II became the sole owner of the farm Woodbourne and Steenbok Island and it was at this time that he instructed Surveyor Pfaff to undertake the survey for a small township called Woodbourne Township or the Heads Township. In 1897 Thomas Henry Duthie II decided to part with the surveyed property lots at the Heads. 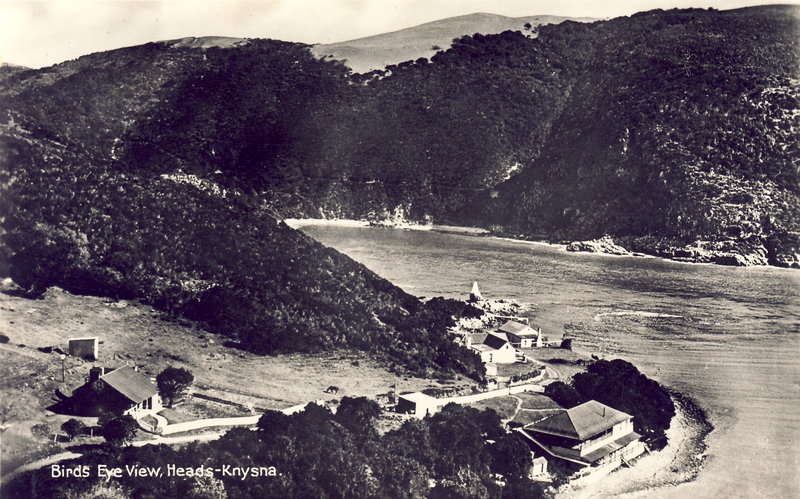 These early plots sold formed the nucleus of the Heads Township which was laid out in 1928 under the trusteeship of Thomas Henry Duthie II and the Knysna Divisional Council. The present piece of land on which the Hope Villa building stands on is today known as Knysna Erf 4869. However, this wasn’t always the case. 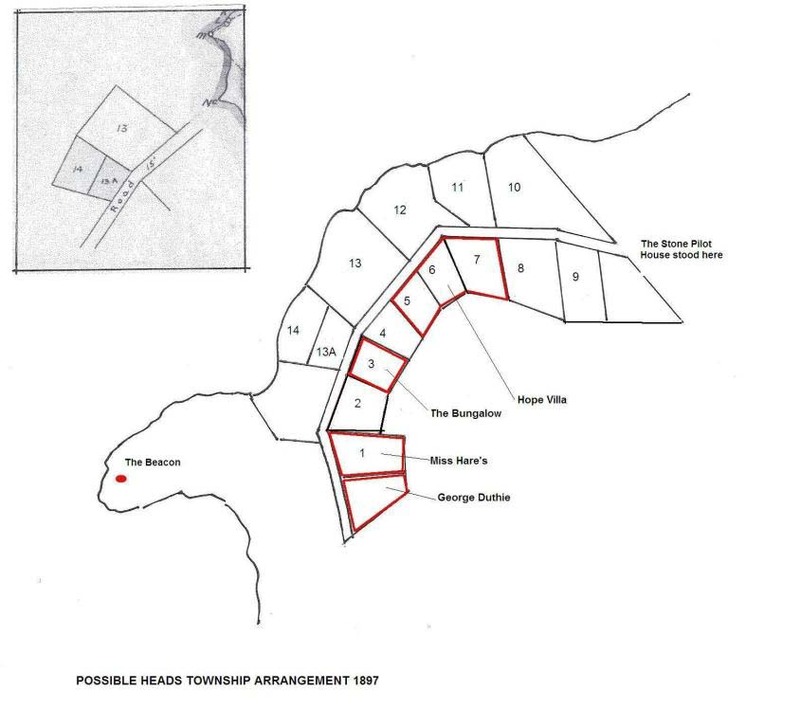 The current Hope Villa property was made up of three lots known in the beginning as Lots 5, 6 and 7, later renamed Erven 1484, 1485 and 1486 (probably when the 1928 Heads Township concept was finalised). The original lot numbers were small numbers as can be seen in the little map which is an extract from a copy of the 1896 survey diagram by Surveyor Willem Melchior Pfaff. This sketch attempts to re-create the possible layout of the Heads Township. The three lots that make up the Hope Villa property were known as Lots 5, 6 and 7. The Deeds Office stores the original Deeds of Sale for these three lots. The land on which Hope Villa was built was owned by Thomas George Anderson Horn, a hotelkeeper. He was born at the Royal Hotel in the Main Street of Knysna in 1859 and became the owner/manager of the hotel after having taken over the management of the hotel from his father Captain Thomas Horn, in 1879. He was reported in the press of 1909 to have been a hotelier for over 30 years. Thomas George Anderson Horn married Maria Magdalene Saunders of Oudtshoorn in 1880. Maria Magdalene had a reputation, not only for her excellent gardens at the Royal Hotel, but also for her architectural and building expertise. 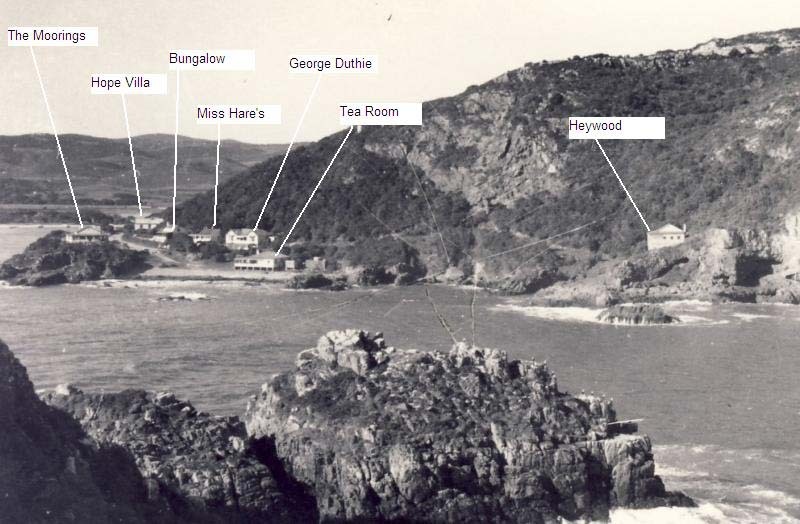 Having successfully grown the business of the hotel in the village of Knysna, Thomas George Anderson Horn decided to create an offer of alternative accommodation for his guests, but at the East Head. He purchased two lots of land on 12 August 1901 on which Hope Villa was built. The Deeds Office records confirm that he actually acquired three lots of property in the Heads Township: Lot 5 and 6 in 1901 and Lot 7 in 1903. These documents reflect the owner of Woodbourne Farm in 1896 as Thomas Duthie II as the seller, and Thomas George Anderson Horn as the purchaser. Maria Horn built Hope Villa in 1901, apparently for her son Robert Benjamin Horn, who was at that time Assistant Resident Magistrate in Tulbagh. It is reported that Maria personally supervised the construction, sitting on a chair, under a black umbrella. Hope Villa was then used as an annex to the Royal Hotel for guests who preferred to stay at The Heads. Thomas George Anderson Horn was the Mayor of Knysna during the period 1909 to 1911. Maria Magdalene Horn died on 10 August 1913, aged only 54. Thomas George Anderson Horn then leased the Royal Hotel to a Mr W. J. Lloyd, a hotel owner from Bloemhof, and retired to Hope Villa, where he died 2 years after the death of his wife, on 22 April 1915. Robert Benjamin Horn, as the eldest son, inherited all of the fixed property of his parents, subject only to a payment of £500 to his younger brother William McGibbon Horn, which was honoured. Robert Horn had married Josephine Robertson (born 1882) and they had a daughter Josephine (Joy) Robertson Horn, who was born on 17 June 1908. They also had a son Leonard (Len) nicknamed Boetie, but in Knysna he was more commonly known as Sonny. Thomas Horn had also purchased property across the road from Hope Villa and laid out a croquet court for the convenience of his guests there. However, the narrow road leading to the East Head beacon was cause for some concern and Robert Benjamin Horn was compelled to relinquish some of his land to accommodate road widening. Even today this road is narrow. In 1940 Josephine wrote through her lawyers to the Knysna Divisional Council that she was prepared to release an additional 18 inches across the front of the ground known as the Croquet Court, over and above the 3 feet released by her late husband Robert Benjamin Horn earlier. Whilst ownership of Hope Villa remained with the Horn/Le Lean family until 1994, the family continued to occupy it only on a temporary basis. However, Thomas George Anderson Horn did move into Hope Villa permanently after his wife’s death in 1913, until he too died in 1915. Robert Horn, owner of the home since 1916, had already left Knysna when he practiced as an assistant magistrate in Tulbagh and then later in Port Elizabeth. But we do know that the family continued to use their home for their summer holidays and then, in the quieter times, the home was let out to travellers, businessmen and holidaymakers, sometimes on a long-term basis. Unfortunately, Robert Horn did not have much longer to live. After falling seriously ill on Friday 11 February 1927 he suffered a stroke in the early hours of Monday 14 Feb 1927 and died, a young man of but 44 years of age. At the time of his death the family home was in Beach Road, Humewood, in Port Elizabeth. His remains are buried in the old Knysna Cemetery. On 3 April 1934 Joy Horn married Martin Bassett Le Lean (born 9 July 1905). Bassett and Joy had a son and only child who was named Leonard Bassett Le Lean (known as Chaps), born on 23 December 1935. Martin Bassett Le Lean died in October 1970. Ownership of the Hope Villa property was transferred to Joy Le Lean, in terms of the Deed of transfer T16176 of 1971. Joy Le Lean died nineteen years later in September 1989. Joy Le Lean had lived in the Hope Villa family home on-and-off for a period of over 80 years. The three original lots were consolidated in 1981, during the time of the Le Lean family ownership, to form the new Erf 4869 of 1304 sq. meters in extent. After her death in 1989, her son Leonard Bassett Le Lean inherited the property. In 1994, Hope Villa was sold out of the family, 93 years after it was built. Special thanks to the Knysna Historical Society, the Knysna Museum and Cristy Le Lean for the use of the images that appear with this article. 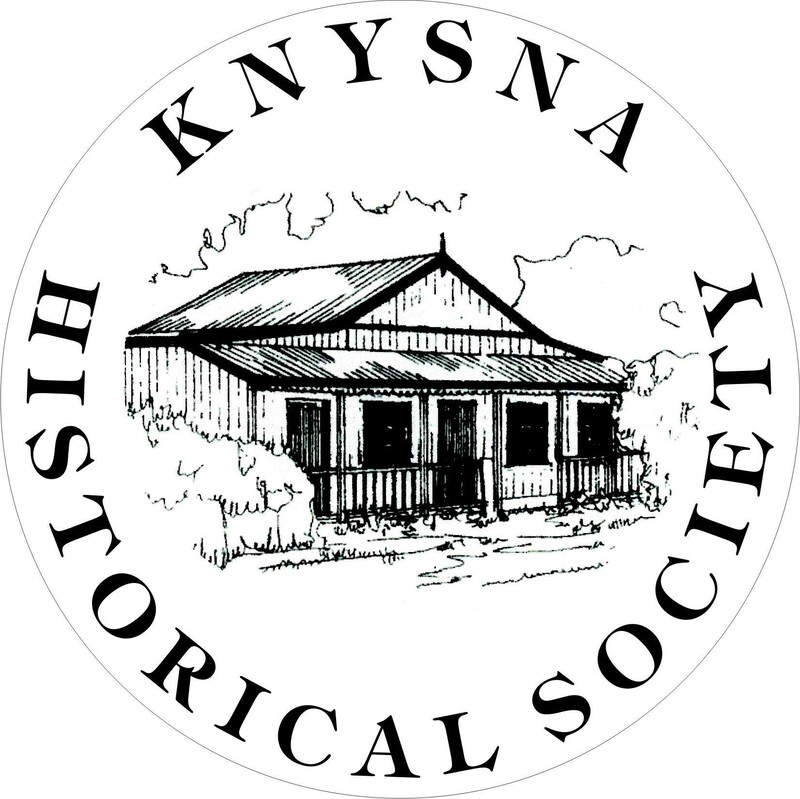 No part of this article may be reproduced or transmitted in any form or by any means without the prior permission of the Knysna Historical Society.